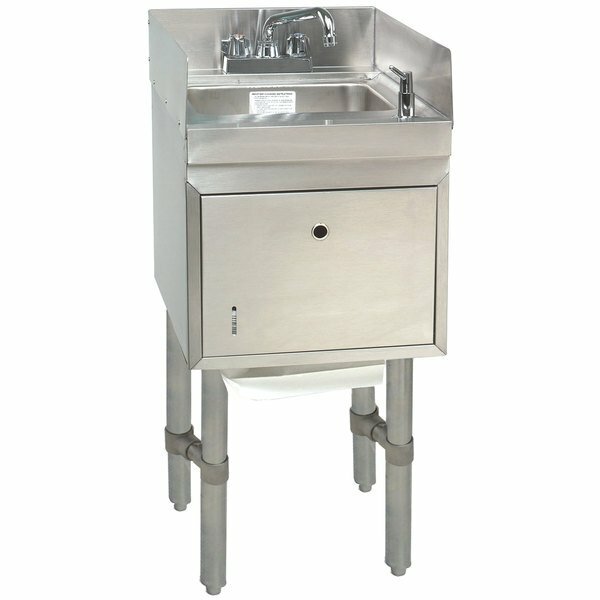 Advance Tabco SC-12-TS-S Stainless Steel Underbar Hand Sink with Soap / Towel Dispensers and Side Splashes - 12" x 21"
Boost the sanitation efforts of your foodservice operation with the versatile Advance Tabco SC-12-TS-S stainless steel underbar hand sink with soap and towel dispensers. This free-standing unit features a one-piece deep drawn sink bowl that measures 9" x 9" x 4", as well as a built-in deck mount soap dispenser and c-fold towel dispenser. By keeping all the essential pieces in one place, your wait staff can enjoy extended convenience and increased efficiency. A 6" deck mounted swing spout faucet can be positioned above any part of the bowl below, and a total of three separate splash guards help protect the walls and floors. A pair of 4" high side splashes are fitted onto either side of the sink, while a 4" high backsplash sits behind the faucet. Other features include a sleek, sturdy design and rear deck for extra storage. A 3 1/2" basket is included with the 1 1/2" IPS drain. Each faucet meets federal lead free standards, making this Advance Tabco SC-12-TS-S hand sink the perfect addition to any commercial kitchen. Overall User Rating: Advance Tabco SC-12-TS-S Stainless Steel Underbar Hand Sink with Soap / Towel Dispensers and Side Splashes - 12" x 21"
Easy to restock and refill, this sink is everything I ever wanted. But for real, an amazing deal for a piece of equipment youll use daily.